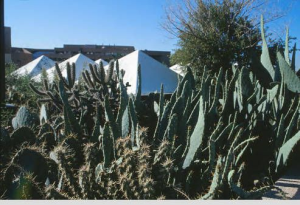 A plant common to the U.S. Southwest, cactus grows in habitats that regularly experience drought. Most cacti are considered succulents, meaning that they store water above ground in their flesh, water they scavenge from their harsh climate with their extensive, wide-spreading root systems. As a result, many cacti grow spines, which are modified leaves, which can prick to the touch. These spines protect the plant against herbivorous predators on the hunt for water during the brutal dry spells that help to characterize their desert environs. Gibson, Arthur C. & Nobel, Park S.
1990 The Cactus Primer. Cambridge: Harvard University Press.